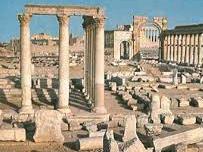 Islamic State (IS, formerly ISIS/ISIL) terrorists have destroyed part of a Roman theater and the legendary four-column structure ‘Tetrapylon’ in the ancient city of Palmyra, the Syrian antiquities chief said. The facade of the Roman theater has been completely destroyed, according to Maamoun Abdulkarim, the Syrian director-general for antiquities and museums, as cited by Reuters. If Islamic State is not ousted from Palmyra in the near future, “it means more destruction,” Abdulkarim added. The scale of damage is currently unknown. “As far as we know, Syrian forces keep on trying to liberate this city and all other from terrorists,” Kremlin Press Secretary Dmitry Peskov told reporters, according to TASS. Peskov declined to comment on whether Russia is planning to help the Syrian Army liberate Palmyra, forwarding the question to the Russian Defense Ministry.